Avian Flu Diary: Bird Flu Spread: The Flyway Or The Highway? The announcement last week that a highly pathogenic avian influenza, only previously seen in Eastern Asia, had turned up at a turkey farm thousands of miles away in central Europe (see Germany Reports H5N8 Outbreak in Turkeys), raises serious questions about how far this emergent virus has already spread in the wild, and elevates concerns over the spread of other novel influenza sub-types as well. The H5N8 virus first made headlines 10 months ago, when on January 19th of this year we learned of an outbreak in South Korea. Within weeks, dozens of farms across that country had been affected, and millions of birds were culled. (see South Korea: 30 Days Into Their H5N8 Outbreak). The virus made a brief appearance in Japan in April, but forewarned authorities quickly quashed that outbreak. Japan’s MAFF (Ministry of Agriculture, Forestry & Fisheries) maintains a large web portal where they follow this virus closely, knowing that migratory birds could easily deliver it back to their shores at any time. The news thus far out of Germany is that no other farms in region have tested positive for the virus (see H5N8 virus: search for the origin). While we don’t know the precise mechanism by which the virus arrived in Germany, migratory birds are viewed as as `highly plausible’ explanation (see UK: Defra Preliminary Assessment On Germany’s H5N8 Outbreak In Poultry). The debate over the role of migratory birds in the spread of avian flu has been a contentious one, with bird enthusiasts pointing to the poorly managed poultry trade as being the root cause, while those in the poultry industry are often quick to blame migratory birds (see Study: The Role Of Migratory Birds In Spreading Bird Flu). Since I don’t have a bird in this fight, I readily concede that both are probably significant contributing factors in the spread of the virus. I see no reason why they should be mutually exclusive. The way that HPAI H5N1 virus spread out of South East Asia to Europe and the Middle East in the middle of the last decade certainly suggests that migratory birds played a major role in its dissemination. We’ve seen that some birds can carry avian influenza viruses without ill effect, and when they encounter other birds, can `share’ their viral cargo along their migratory flyway. Where flyways overlap, there is a greater chance of spreading a virus from one region to another. And as you can see by the map above, they overlap a lot. For the most of the past decade, we’ve basically had only one avian influenza virus to worry about; H5N1. But a little less than two years ago another avian virus with a disturbing penchant for jumping to humans appeared in Eastern China – H7N9 – and that has sparked two seasonal epidemics. The second wave was notably 2.5 times bigger than the first, and a third wave is expected later this winter. Also of note, in the past few months, we’ve seen cases reported in the far western province of China – thousands of kilometers away from where it emerged. Not only does this raise questions regarding the provinces in-between that haven’t reported cases, it begs the question – how did it jump thousands of kilometers to Xinjiang Province? Tracking H7N9 in birds is considerably more difficult than H5N1 or even H5N8, as this H7 subtype doesn’t make birds sick at all – it is a stealth virus. But in humans, it is highly pathogenic. It is literally the first avian flu virus for which humans are the sentinel species. Another recent arrival – H5N6 – appeared on our radar screen last April in Southern China, where it infected local poultry and killed one person (see Sichuan China: 1st Known Human Infection With H5N6 Avian Flu). After a quiet summer, in August reports of the virus began to turn up as far south as Central Vietnam and as far north as China's Heilongjiang Province - more than 2000 miles apart. 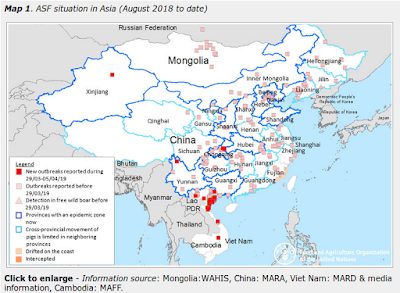 The latest FAO report (see China: H5 AI Rising) showed 24 detections of H5N6 over the past 6 weeks across thousands of miles of China. Whether spread by migratory birds, or facilitated in their travels by commerce or trade – or most likely, as a combination of the two - these emerging avian viruses are moving inexorably westward, and are covering a lot of ground very quickly. All of which should have agricultural and public health interests in India, Pakistan, Kazakhstan, the Middle East, and Eastern Europe on alert for any signs of their arrival this fall and winter – and probably for years to come. I have been in Public Health for 23 years and studying H5N1 since 2005 as a Public Health Emergency Preparedness Planner at the County level, and have these observations: migratory birds are the vectors for spreading virus across vast portions of continents. The local free range poultry are the host populations that provide the "mixing bowl" of viruses. When the migratory birds move north to south they traverse the same territory twice yearly and interact with free range birds in common water and feeding areas, thus mixing viruses. This explains their impact in spreading avian flu viruses over long periods of time. When a suddent spike of avian flu identified with Aisa (China)appears in a distant land (Europe)it must be from the importation of infected birds from a region with the virus. Improving local surveillance is the key to reducing expansion of H5 in poultry populations.